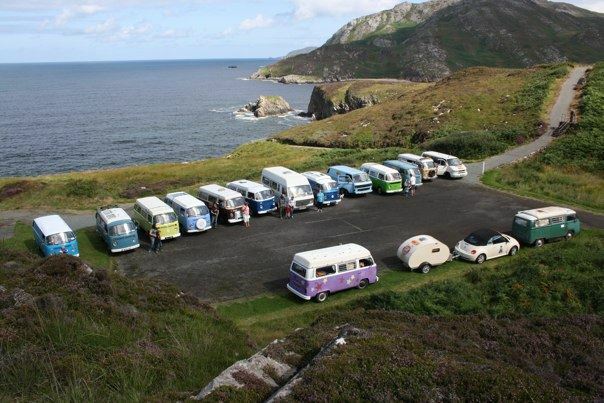 We are Volkswagen camper fanatics that love exploring every inch of Ireland. This is our thirteenth year hitting the road to raise money for some great charities. Reds, blues and oranges we made some spectacle as we made our way through the toll booths on Dublin’s main motorway, the M50. Bemused faces looked out car windows, children waved and smiled. 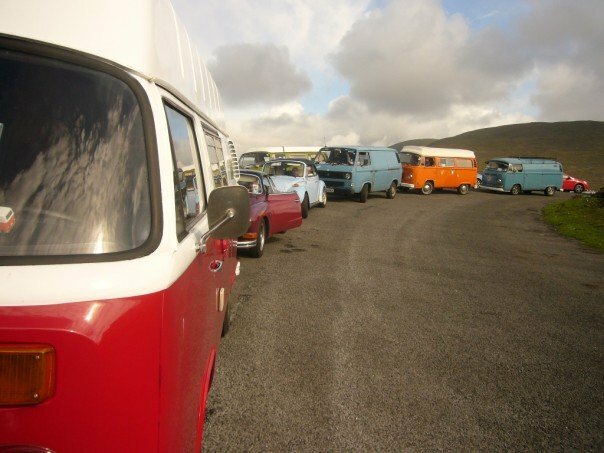 Splits, bays, T25s, Beetles, Karmann Ghias, there were more than we could have hoped for in our colourful convoy. The sense of purpose and excitement was palpable. 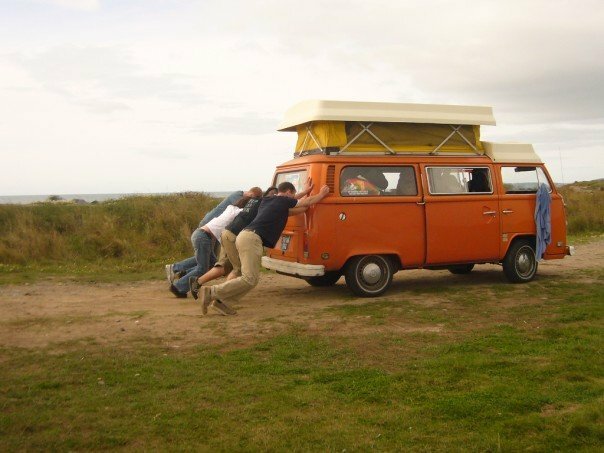 It was a sunny Saturday morning in 2006 when my husband Tony and I, had set out in Super Papous, our 1978 hitop camper. Anticipation was high and contagious. As we met with our fellow travellers, it was clear that this was to be a holiday unlike any other we had previously had. 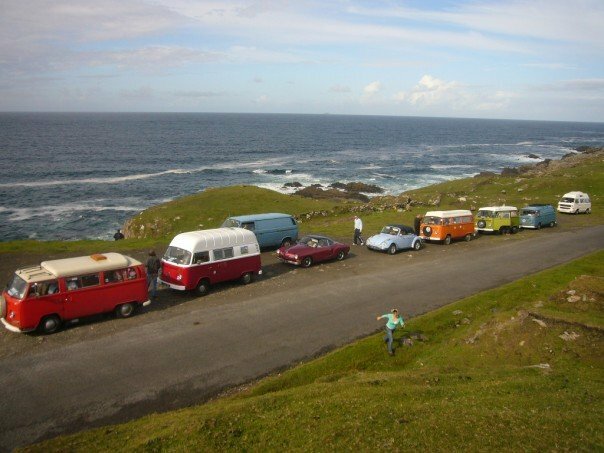 A week, travelling the coastal roads of Ireland with our fellow VW enthusiasts. All in the name of charity, not only were we certain of a good time but we were to achieve something greater along the way. Tolls paid, spirits high at the prospect of the open road ahead, the Eireball 2006 had well and truly begun. Initially a tentative suggestion of a charity drive in aid of Bridges Across Borders (BAB), a Cambodian organisation close to the hearts of Tony and I, the idea snowballed into an 8 day event that saw over 30 VWs take to the roads in aid of BAB and Share a Dream Foundation, an Irish charity devoted to children with long term and terminal illnesses. The enthusiasm and goodwill of T2i members was unparallelled with offers of grounds to use, free design and printing of sponsorship cards and posters and, of course, those willing to partake be it for an hour, a couple of days or the full week. 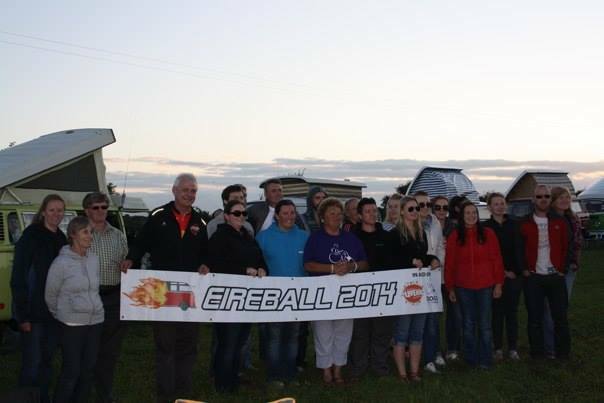 Starting in Armagh, in Northern Ireland that first year, our convoy travelled to the first Eireball camping stop, on the land of a fellow member of type2ireland.org, the site where the Eireball was born. Dave Wheatley, T2i member, had masterminded the original anti-clockwise coastal route taking us as close to the sea as often as possible through some of the most spectacular scenery Ireland has to offer. From isolated winding mountain passes where sheep are a more regular sight than cars to challenging narrow cliff top roads, every moment was the perfect picture opportunity as we glimpsed a flash of yellow turn the bend in front of us and in the rear view mirror was the treat of Bugs and vans meandering their way behind us. With up to 6 hours of driving a day, stopping to refuel vans and people, when the convoy reaches its nightly resting place a flurry of activity occurs. 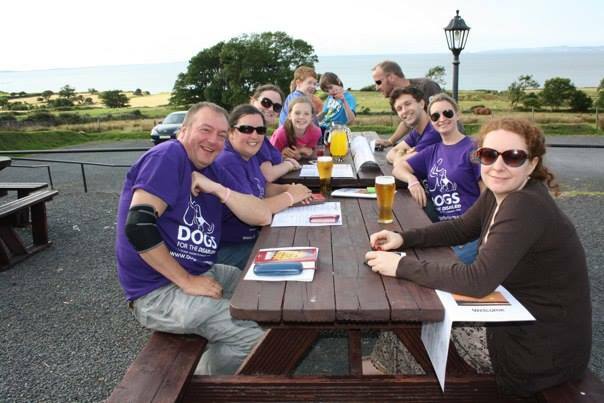 We circle the vans, tops are popped, dogs walked and children run free. Pots and pans clatter, cans fizz and chat and laughter echo through the camp. While each van travels independently the communal nature of the Eireball is much evident at meal times with extras shared, ingredients swapped and groups gathered around tables to eat together. But nowhere is the camaraderie more obvious than when the inevitable happens – a breakdown! From the occasional push or jump start to the need to don overalls and get messy everyone rallies round. Parts are shared – and located from non-Eireball participants if necessary – engines tuned and every effort made to ensure everyone who starts the run completes it in one piece! Alas, it pains me to admit that in this our fourth year we had to leave a van behind. 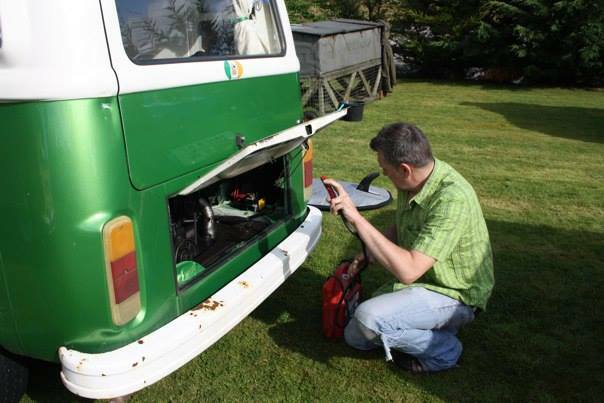 Luke had just had his van restored and put back together in time for the Eireball but didn’t have time to get his 1600 engine sorted. So he threw an old 1200 in to his 1977 bay and hoped for the best. Unfortunately it was not long before the crank shaft oil seal started to leak seriously. Admittedly we did have a book running on how long his clutch would hold out and it lasted longer on the Donegal mountains than even our most ambitious estimate. We had issued an emergency SOS on Irish websites, type2ireland and Eircooled, to source a replacement seal with the heroic intentions of changing it at the side of the road. True to form a seal was located, but in the pure light of day, without the benefit of a few cans it didn’t look like such a practical idea. At this stage the crank shaft oil seal was non-existant, his dynamo was dead and he had no clutch. We reluctantly bid good bye and Luke awaited the AA to come to his rescue. It was a sad day but Luke and his black and yellow bay window “Homer” will go down in history as the first bus to be left behind on the legendary Eireball Run. And that is the real allure of the Eireball – the friendships forged by the shared experience, the camaraderie that gets you to the next destination. Waking up in the morning knowing that another day on the road lies ahead with wit on the CBs, VWs in front of and behind you, stories and laughter around the fire upon arrival. That it has raised over €30,000 for charities in the first three years is a bonus, an incentive to get on the road but that isn’t why people keep coming back. People and their vans have travelled over from the UK year after year because they’re afraid they’ll miss out on the fun! After all, reading about it afterwards just isn’t the same as living it. 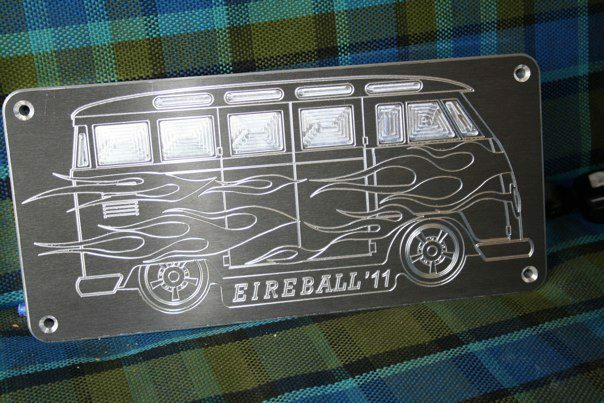 Written by Jacinta Hayes for Volksworld Van and Bus.